TauRx Reports on Their Alzheimer’s Drug. Unfortunately. They reported for the first time on this work yesterday, and. . .well. Unfortunately, it looks to me like they’ve ended up with the same problem as pretty much everyone else who takes a promising Alzheimer’s idea into Phase III: the effect basically disappears. Here’s Adam Feuerstein’s wrapup at TheStreet.com: in 891 patients with mild-to-moderate Alzheimer’s, neither of two doses of the TauRx drug (LTMX) showed efficacy versus the control group by either of two different scales for measuring cognitive decline (the ADAS-cog evaluation or straight brain atrophy measurements). No effect at all. But here’s the kicker: the company says that about 15% of the patients in the trial were not taking any other Alzheimer’s therapy during the trial, and that subgroup showed significant effects with LTMX treatment. As Feuerstein notes, even the head of TauRx says that he has no explanation for these results, although the company believes that they’re significant. I’m not so sure about that, and here’s Matthew Herper with a lot of good reasons to worry. Subgroup analysis is always tricky, and its history in Alzheimer’s is especially fraught (which is one of the reasons I wonder about Eli Lilly pushing ahead with their antibody after basically flat results in their first Phase III). There are just too many ways to get a false positive readout. TauRx may well press ahead on this basis, and good luck to them, but the odds are very steep that there’s nothing to find. Most of the press coverage has been about how the drug failed – which is accurate – but there were some exceptions. The New Scientist, the Times of London and some other UK outlets went with “Alzheimer’s breakthrough!” headlines, which is just not true. I’m not really sure why it was just British readers who got this misleading take, but all the examples I’ve seen have been from England and Scotland. The press over there has been overenthusiastic about Alzheimer’s before, though, so maybe it’s just another round of that. It’s not good reporting, and raises hopes that shouldn’t be raised yet. Since the initial rush of enthusiasm for the TauRx approach in general, I’ve had a lot of email from people who have been scouring the web looking for something to help out a loved one with Alzheimer’s. Over and over I’ve had to tell them that no, there’s nothing new from the company yet. Unfortunately, now I’m going to have to tell them that there’s something new, and it’s not good at all. Significance in Pahse II fails to translate to size of effect in Phase III? Was physiological unbound concentration measured in the course of the Phase I study? I am puzzled and wary about damning LMTM. As I understand it, it had a high rate of slowing cognitive decline in EARLY dementia. It was when later stages were introduced that the drug did not do well. I do know someone who was on the first trials who feels it has saved her bacon. No you don’t. All you need to know is that the British print media is in general scientifically illiterate. The Daily Nazi, sorry the Daily Mail has in the past run articles about “type 1 diabetics kickstarting their pancreas with this amazing diet”, “X causes cancer”….normally followed several weeks later by “X cures cancer”. They scan press releases and quite often combine disparate quotes, resulting in an article and headline which bears little to no resemblance to the original press release. The basic media translation for Americans: in the US, as far as I understand it, newspapers have obligations about accuracy and fairness, and TV basically doesn’t. In the UK, it is the other way around. The Daily Mail is the UK’s Fox News. Small sample sizes (subgroups in this case) can tend to show extreme statistical effects. I can’t help but think that there’s just too much that we don’t yet know about the mechanisms of the brain to be able to treat conditions such as Alzheimer’s. It’s interesting coming from my (computer science) perspective, because, theoretically, the brain should be some sort of finite-state machine. There are a finite amount of neurons and so they can only interact with each other in a finite number of ways; eventually we should be able to successfully model it computationally. But I also can’t shake the feeling that there’s something essential going on that we just fundamentally don’t understand yet about these interactions that’s limiting how we go about treating illnesses involving the brain. It’s difficult enough when we’re just talking about the number of neuronal connections, but when you start taking into account different neurotransmitters, cell surface receptors, epigenetics, etc., things get exponentially more difficult pretty quick. I wouldn’t say “theoretically, the brain should be some sort of finite-state machine.” First, it’s analog. Second, a typical cortical neuron has tens of thousands of connections to other neurons, so while not infinite for all practical purposes it might as well be. . Third, the weights of these connections change every time they’re used. To try to relate some digital circuit to the brain is a hopelessly useless oversimplification. I think your first point has the most validity. There are more real numbers than integers (or rationals, the fractions—they’re pretty much the same thing, mathematically), so you can’t have a state for every analogue state. You can turn the volume up to anywhere between zero and the max volume on an analogue speaker, but you have set increments on a digital system. But if you make those increments small enough, it seems analogue enough, for practical purposes. Tens of thousands, or even millions, of interconnections is not a lot, computationally. It’s solved relatively easily by throwing more computational power at the problem. Changing the weights of connections isn’t a problem either—this is exactly the idea behind (artificial) neural networks, which have application in robotics and data analysis, for example. I’m sure we get back to the analog/continuous problem again here, but as I said, with a small enough incremental change, the discrete weights might look continuous enough. While it would certainly be an oversimplification, I must disagree with it being useless. At the very least, if a computational model was made that didn’t work well enough, we could learn *why* it isn’t good enough, which is certainly not useless. In the end, though, I would argue that our brains are exactly digital circuits, even though they aren’t the normal transistor/resistor/etc. type we typically think about. They’re amazingly complex and have been fine-tuned by millions of years of evolution instead of a few dozen engineers, but that’s no reason to think that we can’t still be smart enough to model them the same way. This about millions of interconnects not being a computational problem – sure, if you know exactly what the interconnects are and how they behave, you can manage that kind of simulation (with a supercomputer, though). The digital/analogue thing is a red herring: you can have fine enough gradations that it doesn’t make a difference, and actually this is relatively easy computationally. But we do not know exactly what the interconnects are, nor exactly how they behave. So the computation you’re looking at has to involve somehow guessing at possibilities until one is found that seems to correspond to reality. That problem is much, much harder (exponentially harder, in the correct sense). Just to make clear how much: if you have only two possible types of interconnect (connected or not), we can, today, manage with supercomputers for systems with up to about 25 nodes, if we write a whole lot of optimisations for the specific problem (which we couldn’t in this case as we don’t really know what we’re looking for). Millions of interconnects? Forget it. The computation is physically not possible before the heat death of the universe (even if you had a computer running on a Planck frequency clock and using every particle in the universe for parallel computation, which is an obvious physical upper limit). It’s not even close, in fact: already with 10,000 neurons and two types of interconnect this problem is physically impossible. This is very fascinating. The question remains though (of course), how do our brains do it then? They certainly have a LOT less molecules than are in the entire universe, and yet here we are having this discussion. This goes back to my previous statement that I think there’s something very fundamental that we don’t yet understand about brains. I must admit, my knowledge of neural networks is lacking at this time, but I didn’t know quite how difficult this type of computation still is. I’m still not convinced that there isn’t a way to produce an artificial brain with equivalent power to ours, since our brains do exist and don’t require all the atoms in the universe to think about things. I’m not holding my breath for this happening any time soon (or even in my life-time) but I do think it is possible. I have terrible news: the number of neurons in a human brain is somewhere north of 80 Billion. Orders of magnitude get really ugly really fast here, and that’s even assuming that you handwave away the problem that we still have only the vaguest model of what any of the “states” of inter-neuron connectivity mean. Eric Jonas’ recent paper, Could a neuroscientist understand a microprocessor? is good reading here. We not only lack a working model, we lack any particularly good reason to believe that we can derive a working model from our current set of observational tools. I will certainly read that article—thank you for bringing it to my attention! I don’t have a lot of (biological/chemical/neurological) knowledge in this area, but it’s always been a fascination of mine that I want to learn more about. I think the future holds some very amazing and surprising answers in this field of research. Thank you for the references—I’m aware that Roger Penrose exists and is a fantastic scientist, but I haven’t really read anything he’s done. I’ll be sure to check this out! Also note that neurofibrillary tangles are a late-stage event in Alzheimer’s. Maybe a tau aggregation inhibitor could prevent progression from mild AD to moderate/severe AD, but it wouldn’t get at the cause of MCI or mild AD. Stopping the progression to the more advanced forms of AD would be a big thing, but it would not be a cure. I’m by no means expert in Alzheimer’s but as an outsider looking in I have to wonder if the problem is that there is not a single dynamic. For a long time it’s been Abeta vs tau. What if either is sufficient but not necessary? Blocking one would therefore not inhibit disease if the other can equally cause damage. Maybe the only answer is to attack both at the same time. My first reaction to the announced results were negative as well, but I am beginning to change my opinion. 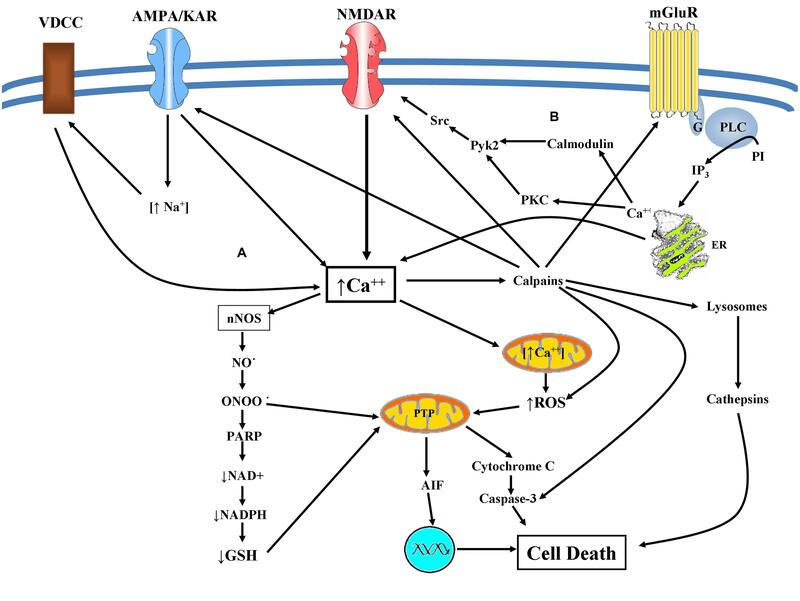 The critical pathway for the formation of Alzheimer’s disease is NMDA receptor activation, neuronal nitric oxide, p38 MAPK, inducible nitric oxide, superoxide anions, peroxynitrite, and caspase-3 along with the release of intracellular calcium. Aricept as a sigma-1 agonist reduces the release of intracellular calcium and thus inhibits acetylcholinesterase activity and the formation of amyloid oligomers but via activation of g proteins it also increases NMDA receptor activity. Curiously the results for Anavex 2-73 (another sigma-1 agonist) also showed better results when the drug was taken alone rather than when it was taken with Aricept. LMTX inhibits inducible nitric oxide formation; Anavex 2-73 inhibits neuronal nitric oxide formation. Here are the reported results for each drug when taken alone. The trial involved 891 people who already had mild or moderate symptoms of Alzheimer’s disease. Of these, 15 per cent received LMTX alone, while the others either took it in conjunction with other treatments they were already taking, or received a placebo. Will better drugs or natural products be found to treat Alzheimer’s disease: most likely. Do LMTX and Anavex 2-73 represent progress–it certainly appears so. There’s actually one very good and credible reason: cherry picking. You always find what you are looking for if you look in the right places, whether it’s really there or not. Surely, they should do a Phase III trial in 890 patients not on medication . Then they will see if their brain dye is worth approving? In the phase II trial patients did not receive other AD medications. Why did the phase 3 trial change the plan? Would it not make a great deal of sense in these trials to adaptively respond as the results accumulated? The monotherapy condition was prespecified, so this result was not entirely unexpected. TheStreet.com article noted that the second Phase III is also expected to show benefit with LMTX monotherapy and that the primary analysis and statistical plan were changed before database lock. Posters on this thread have a much better understanding of real world pharma than me. Could this mean what I think it means? Namely, taurx had the results of the first phase III and have now changed the primary endpoint to the monotherapy group? That would change the entire conversation. In such a scenario, the headline would be primary endpoint reached and underneath overall result negative. Cloud-based robotics labs such as Transcriptic and Emerald will make it easier to dig into the fundamental pathways and mechanisms to create better drug candidates. By emphasizing creativity rather than brute force, they also help level the Black-white gap. Blacks invented whole new generas of music, in contrast to the factory-labour that built the white middle class. With 1 billion people in Africa, and rising, this could be our best hope to defeat Alzheimers et al. If this is the case [and there certainly seems like there’s something to it] then ALZ prevention is within the grasp of each of us, via proactively maintaining the integrity of one’s own blood:brain barrier. As for myself, I engage in high intensity interval training 3-4X/week, to [among other things] promote vascular health. Phase III trials require a Statistical Analysis Plan before they start (and they have to be approved) which defines what tests will be made. Anything else is regarded as a fishing exercise and is not allowed in any submission. Also, the total number of tests is used to set the degree of difficulty to achieve statistical significance. The press release from TauRx says the “… treatment benefit was confirmed in a prespecified supportive analysis …” so with probability of the null hypothesis from <0.0001 to 0.0023, these statistical results are "genuine" ie achieved in an approved way. The next step is the usual gamble of going from one study to the next to confirm or refute this secondary end-point, so would I bet my house on it? No, but then I don't gamble. And, while it is galling to medicinal chemists that a 100 year old dye is being tested, that does not make it wrong. Look at dimethyl fumarate. Yep – they will need another trial on unmedicated patients in order to get anything from this. They might get away with something if the patients who benefited in this trial are still being given the drug on compassionate use programs and they get a ton of good PV data. Agree that the age and the fact that it doesn’t look fancy shouldn’t be held against a molecule. However, one should bear in mind that the development of dimethyl fumarate was supported by more than two decades of successful use of mixed fumaric acid esters (Fumaderm) for the treatment of psoriasis in some European countries. It’s highly doubtful that tecfidera would exist today if it wasn’t for these data as the mechanism of action of dimethyl fumarate is still pretty much elusive (if one doesn’t buy into the Nrf2 story…). I am assuming you are laughing because I left out receptor from sigma-1 agonist. Be that as it may Aricept and Anavex 2-73 are both sigma-1 receptor agonists. I know that quite a few people have had good laughs at my expense over the years, but I hope to have the last laugh and the sooner the better. Has the taurx presentation for LMTX as presented yesterday in Toronto been uploaded yet to the web? Does anyone know how many patients were in the different treatment/placebo arms and how many in each were on monotherapy? Oh, baloney! We just need to break out of the amyloid-centric and (to a much lesser degree) tau-centric hypotheses that have dominated the field for decades. It’s not an uncrackable problem, as long as we can unlearn what we think we know that actually ain’t true. We most certainly don’t need a superintelligent AI or any other God to tell us what to do. Stat News said it was 15%. https://www.statnews.com/2016/07/27/alzheimers-drug-taurx/ We didn’t get absolute numbers but if about half of the 800 were on placebo and it’s 15% of those on the drug that’s around 60 people. taurx is now talking about an open label extension of the first phase 3 trial. Would such a trial already be underway? Would taurx not now have an additional 218,000 patient days of data since the end of the trial? Should not this additional information help provide a definitive answer to the question of whether LMTX is effective or not? > “Alzheimer’s breakthrough!” headlines, which is just not true. Maybe they’d read the negative results, but then promptly forgot them. Where is the critical commentary from medicinal chemists? This is not a question of clinical data or “tau vs. amyloid”. This is simply about bad molecules. Methylene blue? Please…this compound causes false positives in every assay it goes into. Anybody remember congo red? Same deal. These compounds were false positives that never should have been advanced into development. Add these failed projects to the heap of “Alzheimer’s antibodies” and “Alzheimer’s vaccines” that don’t get into the brain. For the sake of pharma companies, and for the sake of Alzheimer’s patients, I hope to God that medicinal chemists develop some good brain permeable small molecule drugs. I didn’t mean to imply that methylene blue doesn’t get into the brain. It’s the AD antibodies and “vaccines” that don’t get into the brain. Methylene blue (and congo red) are simply in vitro false positives that impact neither amyloid pathology nor tau pathology. It doesn’t matter at all whether they get into the brain. Title: Methylene blue inhibits the increase of inducible nitric oxide synthase activity induced by stress and lipopolysaccharide in the medial basal hypothalamus of rats. Inducible nitric oxide combines with superoxide anions to produce peroxynitrite. Title: Peroxynitrite induces Alzheimer-like tau modifications and accumulation in rat brain and its underlying mechanisms. Melatonin arrests peroxynitrite-induced tau hyperphosphorylation and the overactivation of protein kinases in rat brain. The simplest but not necessarily correct explanation for the lack of improvement in people taking Alzheimer’s drugs in addition to LMTX is that Aricept interferes with the ability of LMTX to inhibit inducible nitric oxide synthase. The apparent ability of LMTX to sharply reduce the progression of Alzheimer’s disease and of Anavex 2-73 to substantially stabilize Alzheimer’s disease are promising developments. I cannot offer much more myself. At this point, the best that appears possible is to slightly reverse the progression of the disease, but that is a big leap forward from where we are now. Given the abundant evidence on Abeta and tau, it still escapes me why they couldn’t both play a causative role and why the lack of effect in targeting one or the other might just mean you need to target both at the same time. The idea that there is only one single pathway that is both necessary and sufficient to cause a particular disease is attractive but not necessarily true; it may be that there are at least two, either one of which is sufficient but not necessary. Is there something upstream of these events that causes AD? I believe so, but this is a question for which reliable data are lacking. About all we can say with certainty is that the screwball notion it is caused by peroxynitrite is trivially dismissable. Again, not an AD expert but transgenic mice with increases in either amyloid or tau get disease; duplication of the APP gene in Down’s syndrome leads to damage typical of AD; and anti-AD antibodies slow down progression of disease. Combining APP and tau transgenics results in increased disease. Just seems logical to me to try agents that target both in a single trial. No, they don’t. The transgenic rodents have Abeta at hundreds of times the level seen in any human brain. There’s no rodent model of anything like human AD. I disagree. The J20 transgenic mouse is a reasonable model, widely used. The other points are valid as well. It’s silly to argue this, the only way to know whether the combination would work would be to do the trial. You may not agree but it’s just your opinion; you can’t simply argue convincingly against it from first principles. I agree with much of what Mark says except for peroxynitrite (ONOO-) See link below for its role in Alzheimer’s disease (although tyrosine nitration should be added to the chart). Protein kinase C alpha activation can lead to the formation of peroxynitrite, caspase-3 activation, and neuronal apoptosis, especially in Alzheimer’s disease where either due to presenilin-1 gene mutations or due to nitration the neuroprotective phosphatidylinositol-3 kinase/Akt pathway is cut off. Increasing myo-inositol levels due to Down syndrome, high sodium levels, or high glucose levels increases the substrate for phospholipase C and phoshadtidyinositol-3 kinase (phosphatidyinositol 4,5 biphosphate). Everyone with Down syndrome disease will develop amyloid and tau tangles, but not everyone with Down syndrome will develop Alzheimer’s disease because individuals with Down syndrome have high levels of hydrogen sulfide and hydrogen sulfide is a peroxynitrite scavenger. Protein kinase C activation: secretion of amyloid precursor protein. Caspase-3 activation leading to BACE 1 activation: first cut in amyloid precursor protein. Intracellular calcium release leading to calpain activation (via phosphollipase C): second cut in amyloid precursor protein. Oxidant liberation of intracellular copper and zinc: aggregation of amyloid monomers into amyloid oligomers. In part beta amyloid and neurofibrillary tangles are the product of oxidative stress and the amyloid precursor protein and amyloid oligomers add to oxidative stress by activating g protein-coupled receptors which leads to the activation of phosphalipse C and protein kinase C. But all sorts of other factors can activate this pathway including various air pollutants, herbicides and pesticides, industrial solvents, psychological stress, chronic acetaminophen use, various chronic bacterial, viral, and fungal infections, moderate to heavy smoking, and the Apoe4 gene. As long as peroxynitrite is being sufficiently scavenged primarily be glutathione it is possible to have both amyloid and tangles in ones brain without having Alzheimer’s disease. Once oxidative stress becomes too great, glutathione levels plummet and oxidative stress begins to damage key receptors, enzymes, and transport systems in the brain, leading to critical shortages and neurotransmitters required for the retrieval of short-term memory, sleep, mood, social recognition, and alertness. On the other hand if intracellular calcium levels are inhibited, it is possible to have Alzheimer’s disease with very few plaques and relatively few tangles. Efforts to remove amyloid oligomers and inhibit or reverse tau hyperphosphorylation have all failed to date. Efforts to limit peroxynitrite formation have shown some limited effectiveness and certain peroxynitrite scavengers (Korean red ginseng and heat processed ginseng, for example) have partially reversed Alzheimer’s disease in human clinical trials. I’m not sure how to reply to your reply, however, the J20 mouse model doesn’t phenotypically differ significantly from most other APP mouse models. Even the Alzforum entry says “No significant neuronal loss…”. Neuronal loss is a characteristic of AD. You need to read the whole article, not just take a selected quote. It may not be an exact phenocopy but it’s close enough to show the effects of mutated Abeta (below). My point is that there is plenty of evidence for the involvement of both Abeta and of Tau and that maybe both need to be targeted at the same time to see a therapeutic benefit. Simply blocking one or the other may not suffice. The only way to tell would be to do the trial. Deficits in spatial memory and learning appear as the mice age. As early as 16 weeks, J20 mice demonstrate spatial reference memory deficits as measured by the radial arm maze (Wright et al., 2013). By six to seven months, deficits in spatial memory retention and acquisition in the water maze are observed (Palop et al., 2003). Changes in synaptic plasticity are also observed. J20 mice between the ages of three and six months show deficits in basal synaptic transmission. Extracellularly recorded field EPSPs at the Schaffer collateral to CA1 synapse in acute hippocampal slices were on average smaller in amplitude than those seen in wild-type mice. J20 mice also had significant deficits in LTP at the Schaffer collateral–CA1 synapse compared with control mice at this age (Saganich et al., 2006). This is the most telling study regarding the J20 mouse model for Alzheimer’s disease. My one qualification is that inflammation in part due to microglia activation may be high early in Alzheimer’s disease, but microglia may become deactivated as the disease progresses. You can link nearly every feature of Alzheimer’s disease to nitro-oxidative stress: amyloid plaques, hyperphosphorylated and nitrated tau, inhibition of choline transport, damage to choline acetyltransferases, damage to receptors governing the release of neurotransmitters required for retrieval of short-term memory, sleep, mood, social recognition, and alertness, decreased blood flow in the brain, decreased transport of glucose in the brain, an end to neurogenesis in the hippocampus, and the death of neurons. And the only compounds that have partially reversed this damage and thus partially reversed Alzheimer’s disease are particularly good peroxynitrite scavengers. I am a poor messenger, but the answer on how to treat this disease should be clear. The issue isn’t whether APP mice have age-related cognitive deficits, they do, as shown by numerous studies, including those on J20 mice. Note also that most transgenic APP mice produce identical Abeta peptides, albeit sometimes with an altered ratio of Ab40 to Ab42. The questions are 1) whether those cognitive deficits are caused by Abeta, or by the mutated APP per se. The systematic analysis I posted suggests that the causative agent might be APP itself. and 2) why the mice do not experience loss of neurons, as is seen in human AD. As to tau versus APP/Abeta, given that nobody has substantiated a mechanistic between the two, indeed one would be wise to consider both, and not assume which is the most significant in disease, or most likely to be successfully targeted. I am sure that we have all been awaiting word from alzforum. They have a very negative interpretation of the LMTX results. Headline reads Phase 3 LMTX hits its primary endpoint with monotherapy subgroup. If only the primary analysis matters, and we know the second phase 3 hit its primary endpoint, now what? The FTD phase 3 looks like it might have hit something too! The reports “results will be delayed for a few weeks in order to permit the company to protect intellectual property arising from the on-going analysis of the patient data.” taurx needs to get its intellectual property rights claims in order? That does not sound like failure. This is now quite confusing. Why didn’t taurx do the straight comparison between monotherapy LMTX and non-treated placebo? That clearly seems to be the big out here. If they are only seeing a large difference because the LMTX monotherapy had mostly now progressive patients who did not feel the need for standard of care and they were compared to placebo patients who were on standard of care because they were progressors, then the whole result is meaningless. The idea that amyloid and/or tau tangles are the cause of Alzheimer’s disease, which is based much more upon inference than direct evidence, is the greatest obstacle to the effective treatment of Alzheimer’s disease. It might interest you, though, to investigate the role of APOE in Alzheimer’s disease. This gene is particularly interesting as people who have two copies of the APOE2 form almost never get AD, while those who have two copies of the APOE4 form are more than 50% likely to develop the disease at some point. Nothing else is known to categorically prevent the onset of AD, apart from being young. A more detailed response in terms of mechanism may appear on Monday with links. But if not, thank you for your comment and links. I always appreciate it when someone civilly disagrees with me–recognizing that I am far from infallible but still appreciating the effort. The way in which the Apoe4 increases the risk for Alzheimer’s disease has bedeviled me for years. The easiest think to do is to say it increases levels of low density lipids and leave it at that. And while this may be a factor in that it increases lipid rafts, it never seemed like a sufficient answer. A research friend and I have recently been able to tentatively link Apoe4 (and also the c-terminal fragment of the amyloid precursor protein and amyloid oligomers) to the activation of the non-canonical Wnt/frizzled receptor pathway. Frizzled receptors are g protein-coupled receptors that activate protein kinase C alpha. But unlike mutations in the amyloid precursor protein, neither Apoe4 nor the c-terminal fragment of the amyloid precursor protein nor amyloid oligomers are sufficient in themselves to create levels of oxidative stress needed to trigger Alzheimer’s disease. Some other factors or factors are needed. In other words blocking the effects of Apoe4, BACE 1 inhibition, or removing amyloid oligomers may extend the time for the onset of Alzheimer’s disease and can perhaps in a minor way slow down the disease early on, but it is not likely to prevent the disease or to effectively treat it. The truly intriguing thing about APOE is the APOE2 isoform, which is much more rarely studied. People with two copies of this form almost never get AD. Furthermore, the APOE2 form increases plasma lipid/cholesterol levels, which thus dissociates the protective effect of APOE2 from the known effects of APOE in receptor binding and plasma lipoprotein metabolism. What has been shown by a number of groups, though, is that APOE can modify the anatomical distribution of amyloid in the mouse brain, and this occurs without there being a corresponding effect on the total amount of amyloid produced. So it appears that APOE interacts in some way with the APP protein itself — how this may occur is quite mysterious. From above article: Previously, we reported that the His-rich domain of selenoprotein P (SelP-H) inhibited metal-induced aggregation and toxicity of Aβ, due to its metal chelation ability. Here we demonstrated that SelP-H not only inhibited copper-mediated tau aggregation but also interfered with the ongoing aggregation and reversed the already formed aggregates. That’s interesting, however note that “ApoE receptor 2” is not the same as “APOE2 receptor”. It is one of a class of receptors that can bind apoE, although their biological roles are not restricted tho this. Also, the only confirmed biological effect of the variation that makes APOE2 different from other forms of APOE is a loss of binding to the LDL receptor. Unfortunately this does not appear to be important in AD. Bank, I apologize for getting the wrong receptor. It appears that ApoE2 binds to the very low density lipoprotein receptor. Title: Very low density lipoprotein receptor binds apolipoprotein E2/2 as well as apolipoprotein E3/3. I am going to make a bit of a reach here. Reelin which increase selenoprotein levels in the brain via APOE receptor-2 (and thus decreases peroxynitrite levels in the brain) also binds to the very low density lipoprotein receptor. Perhaps by also binding to very low density lipoprotein receptors, ApoE2 (and 3) increases reelin signalling via APOE receptor-2. In any case LDL by itself and amyloid oligomers by themselves appear to play a minor role in Alzheimer’s disease at best. And they are only additive factors under high levels of oxidative stress. CPC-201 is simply donepezil plus another drug to reduce the side-effects of donepzeil. Sure, donepezil is highly effective in reducing the symptoms of mild AD, but it does not slow down or stop progression of the disease. That is true, though they increased the dose of Aricept by 4 times. Derek, you know that people was using aspirin long before we understand its fully mechanism of action…..
And what stops this attempt by neurons to save themselves from apoptosis via oxidative phosphorylation: peroxynitrite and nitrite. Title: Oxidative stress and inhibition of oxidative phosphorylation induced by peroxynitrite and nitrite in rat brain subcellular fractions. LMTX limits the formation of peroxynitrite by inhibiting inducible nitric oxide synthase and NADPH oxidase and by inhibiting peroxynitrite it also inhibits the aggregation of tau proteins. Does it do so in a significant enough manner to substantially slow down the progression of Alzheimer’s disease: that question can only be answered by a further trial. It appears that the LMTX clinical trial of circa 800( Trial 237-005 ) patients with mild AD also failed and that these results are similar to the results reported previously in Lancet (Trial 237-015). I am informed that in the 237-005 about 200 patients were exclusively on LMTX only an that the patients ha a positive response with significant reduction in progression of symptoms. I am also told that the control group with only 4 mg of LMTX showed a similar reduction fin the progression of the disease. Tau Rx has indicated that they will report “soon” on these results. It appears that patients on monorx responded and that patients on multirx failed.If this data is accurate it appears that Aricept, Excelon, or possibly Nameda interfere with the action of LMTX. The explanation I heard was somewhat simplistic and talked about a loaded transport system were all the seats are tightly held by Aricept, Excelon, or Nameda agents and there is no room for LMTX to get on this “loaded bus” My spouse is in trial group 237-005 and when we read about the failure of trial 237-015 we decided together with her treating Neurologist to stop Excelon and Named and convert her to strict monorx receiving only LMTX. One month later I had to re-start her on both Excelon and Nameda as she deteriorated very rapidly to a significant degree. After restarting her on these agents she gradually recovered to her earlier clinical status. I talked to her treating Neurologist with the intend to stop the LMTX as both large trials failed but her suggested that we should continue for at least several more months as some “interesting data may emerge ” when Taurx reports on the trial. My spouse hs been on LMTX now for about 3 plus years and has continued to show deterioration in her functional status. The rate however appears to be very slow as she is APOE-4 positive with the worst allelic combo and has been first diagnosed in 2005. So she has been with obvious clinical disease now for 12 years which in my understanding is very long for her APOE-4 status. She has also had 8 MRI studies which indicated stabilization with no increased atrophy over the past 4 years! it is possible that a sudden withdrawal of excelon and Nameda will cause a sudden deterioration before the LMTM effect kicks in.